An Associate Accountant supports the Senior Accountants and auditors of the company with regards to administrative, Accounts payable, Accounts Receivable, clerical and bookkeeping tasks. Some of the job responsibilities depicted in the Associate Accountant Resume Sample include reviewing accounting transactions and ledger book account numbers of various departments. Additionally, an associate Accountant needs to download and review daily lockbox reports and assist with budgeting and audits. 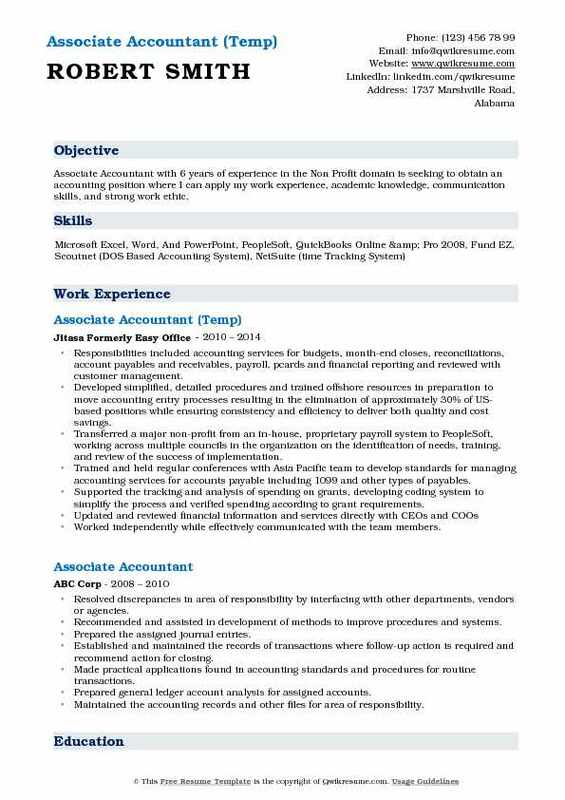 The best Associate Accountant resume should showcase strong analytical, interpersonal and organizational skills. An individual seeking to gain entry as an Associate Accountant should have a Bachelors Degree in Accounting, finance or its related field. Employers even consider the Resumes that contain a high school degree or associate degree for filling this vacancy. Summary : Associate Accountant with more than 15 years of experience in the Finance domain is seeking a position as Staff Accountant, where intensive experiences will be further developed and utilized. Skills : Accounting, Accounting And Finance., Auditing, Fund Accounting, GAAP. Compiled and analyzed the account information to prepare asset, liability and capital account entries. Investigated and reconciled the financial discrepancies rapidly by collecting and analyzing account information. Reconciled general ledger accounts, subsidiary accounts, and bank statements. Summarized the current financial status by collecting information to prepare monthly and year end closing financial statement reports with disclosures according to GAAP. Engaged with the auditors for preliminary auditing and year- end auditing. Knowledge of unrestricted fund, temporary restricted fund, and permanent restricted fund. Released the expenses due to from temporary restricted and endowment to unrestricted fund. Set up and calculating the employees benefits such as retirement plan, health insurance, workers comp. Processed the semiweekly payrolls with multi-state payrolls and make payroll tax deposits to state and federal. Prepared quarterly payroll taxes return 941 and 941 schedule B for federal, and DE 6 for CA state. Applied and followed up the regulation from state and federal payroll law. Processed and reviewed the billing to member schools, customers, and students. 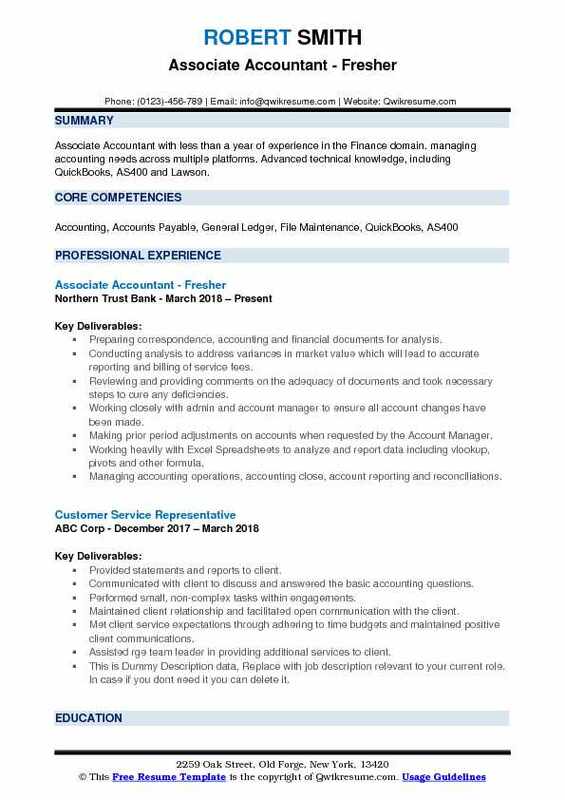 Objective : Associate Accountant with less than a year of experience in the Finance domain. managing accounting needs across multiple platforms. Advanced technical knowledge, including QuickBooks, AS400 and Lawson. Preparing correspondence, accounting and financial documents for analysis. Conducting analysis to address variances in market value which will lead to accurate reporting and billing of service fees. Reviewing and providing comments on the adequacy of documents and took necessary steps to cure any deficiencies. Working closely with admin and account manager to ensure all account changes have been made. Making prior period adjustments on accounts when requested by the Account Manager. Working heavily with Excel Spreadsheets to analyze and report data including vlookup, pivots and other formula. Managing accounting operations, accounting close, account reporting and reconciliations. Receiving, recording, and bankig cash, checks, and vouchers as well as reconciling the records of bank transactions. Working with management to document and offset unusual expense variances in their respective areas. Investigating and resolving the discrepancies in monthly bank accounts while under tight deadlines. Verifying details of transactions, including funds received and total account balances. Working with Excel spreadsheets daily including Vlookups and Pivot tables. 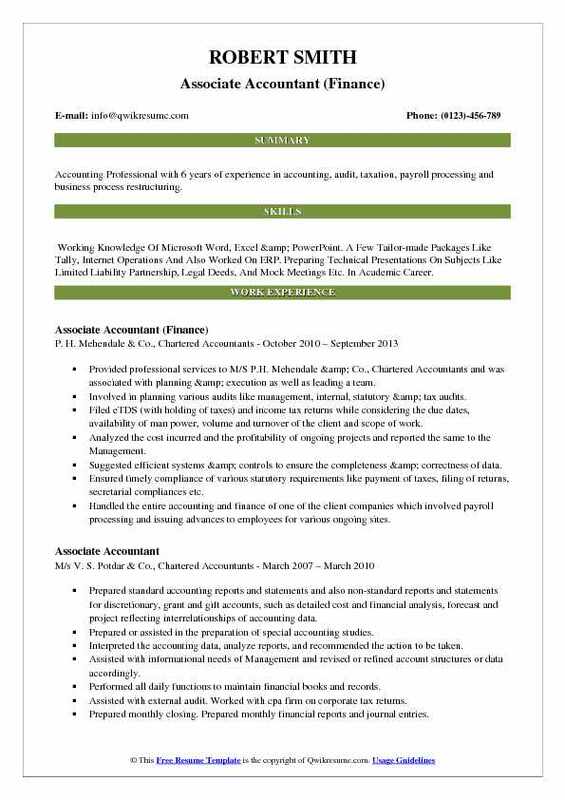 Headline : Accounting Professional with 6 years of experience in accounting, audit, taxation, payroll processing and business process restructuring. Skills : Working Knowledge Of Microsoft Word, Excel & PowerPoint. A Few Tailor-made Packages Like Tally, Internet Operations And Also Worked On ERP. Preparing Technical Presentations On Subjects Like Limited Liability Partnership, Legal Deeds, And Mock Meetings Etc. In Academic Career. Provided professional services to M/S P.H. Mehendale & Co., Chartered Accountants and was associated with planning & execution as well as leading a team. Involved in planning various audits like management, internal, statutory & tax audits. Filed eTDS (with holding of taxes) and income tax returns while considering the due dates, availability of man power, volume and turnover of the client and scope of work. Analyzed the cost incurred and the profitability of ongoing projects and reported the same to the Management. Suggested efficient systems & controls to ensure the completeness & correctness of data. Ensured timely compliance of various statutory requirements like payment of taxes, filing of returns, secretarial compliances etc. Handled the entire accounting and finance of one of the client companies which involved payroll processing and issuing advances to employees for various ongoing sites. Complied with statutory dues like payments of MVAT, employees profession tax, TDS etc and filing the returns like eTDS returns, income tax returns etc. Interacted with and provided required information to the Statutory Auditors. 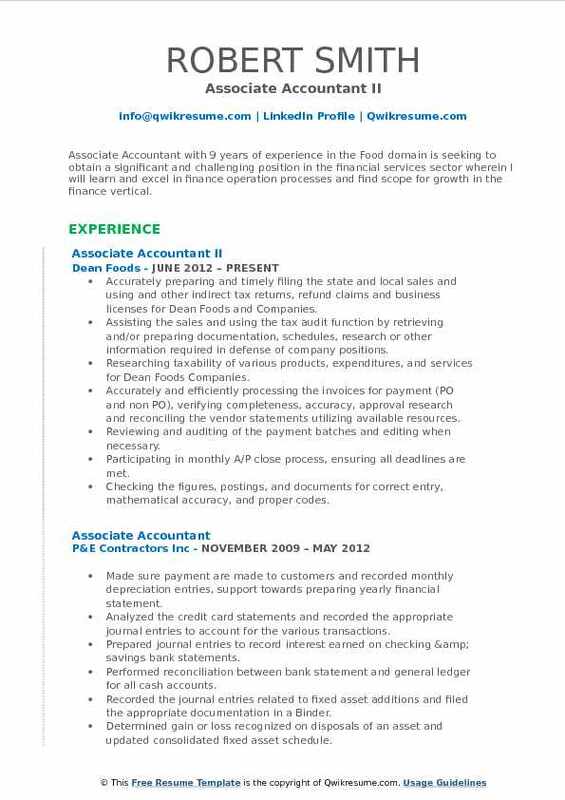 Summary : Associate Accountant with 9 years of experience in the Food domain is seeking to obtain a significant and challenging position in the financial services sector wherein I will learn and excel in finance operation processes and find scope for growth in the finance vertical. Accurately preparing and timely filing the state and local sales and using and other indirect tax returns, refund claims and business licenses for Dean Foods and Companies. Assisting the sales and using the tax audit function by retrieving and/or preparing documentation, schedules, research or other information required in defense of company positions. Researching taxability of various products, expenditures, and services for Dean Foods Companies. Accurately and efficiently processing the invoices for payment (PO and non PO), verifying completeness, accuracy, approval research and reconciling the vendor statements utilizing available resources. Reviewing and auditing of the payment batches and editing when necessary. Participating in monthly A/P close process, ensuring all deadlines are met. Checking the figures, postings, and documents for correct entry, mathematical accuracy, and proper codes. Redistributing the purchase order invoice cost and processing of urgent payments request. Issuing the weekly and monthly accounts payable distribution reports and work with corporate accountants as to accounts payable interface with general ledger. Headline : Associate Accountant employed by one of the biggest corporate real estate corporations in the country, Jones Lang Lasalle. Through my experience and education, I am knowledgeable about the development and the structure of the finances within a company. Not only am I dedicated in my career, I am eager to learn more to bolster my team and my company. Responsible for the recognition of $2m in revenue for over 20 accounts to meet strict monthly deadlines. Overseeing and monitoring the deferred income balance sheet account for over 150 accounts. Preparing check requests, wire requests, and EFTs to client finance team to fund non-reimbursable expenses. Making proper P&L journal entries for reimbursable expenses and capitalizing the expenses. Amortizing the prepaid management fees and prepaid transition costs over the life of the contract. Auditing the annual budgets and mid-year reforecast projections for over 20 accounts. Constructing the monthly, QOQ, and YOY variance analysis on financial statements. Assisting the the compliance and procedure committee in improving inefficiencies within financial structure and reporting. Providing an in-depth analysis of shortfalls in performance and provide solutions to improve inefficiencies. Acting as the main communication hub between client finance and corporate finance, while anticipating problems and solving them. Demonstrating the thorough understanding of complex MSAS and strict GAAP guidelines to ensure proper financial representation. 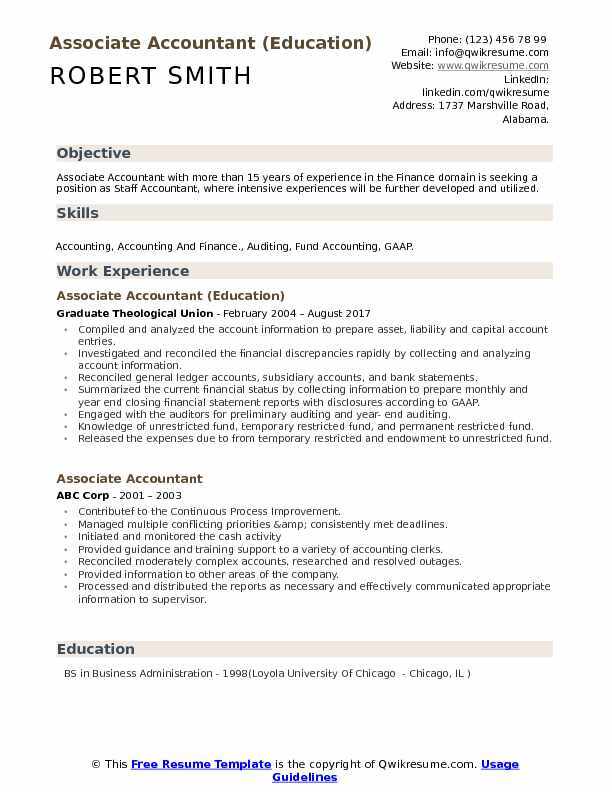 Headline : Associate Accountant with 6 years of experience in the Non Profit domain is seeking to obtain an accounting position where I can apply my work experience, academic knowledge, communication skills, and strong work ethic. Responsibilities included accounting services for budgets, month-end closes, reconciliations, account payables and receivables, payroll, pcards and financial reporting and reviewed with customer management. Developed simplified, detailed procedures and trained offshore resources in preparation to move accounting entry processes resulting in the elimination of approximately 30% of US-based positions while ensuring consistency and efficiency to deliver both quality and cost savings. Transferred a major non-profit from an in-house, proprietary payroll system to PeopleSoft, working across multiple councils in the organization on the identification of needs, training, and review of the success of implementation. Trained and held regular conferences with Asia Pacific team to develop standards for managing accounting services for accounts payable including 1099 and other types of payables. Supported the tracking and analysis of spending on grants, developing coding system to simplify the process and verified spending according to grant requirements. Worked independently while effectively communicated with the team members. 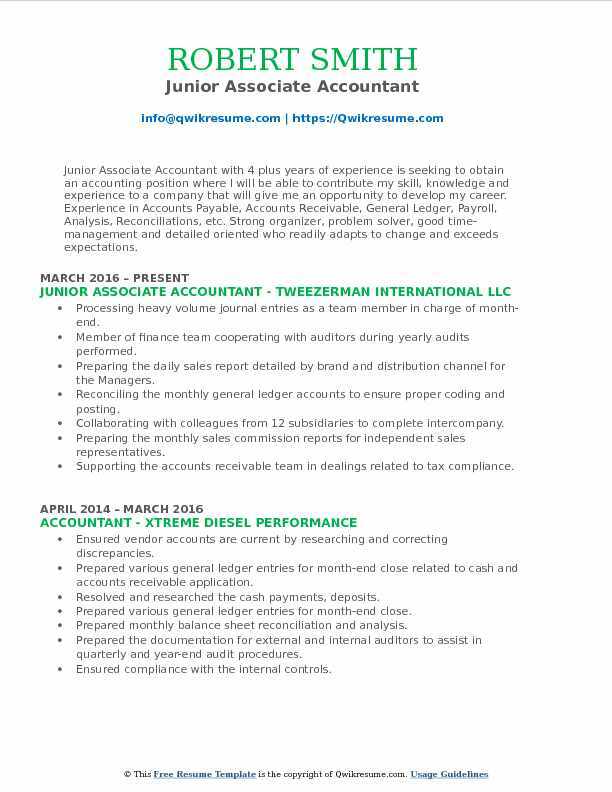 Objective : Junior Associate Accountant with 4 plus years of experience is seeking to obtain an accounting position where I will be able to contribute my skill, knowledge and experience to a company that will give me an opportunity to develop my career. 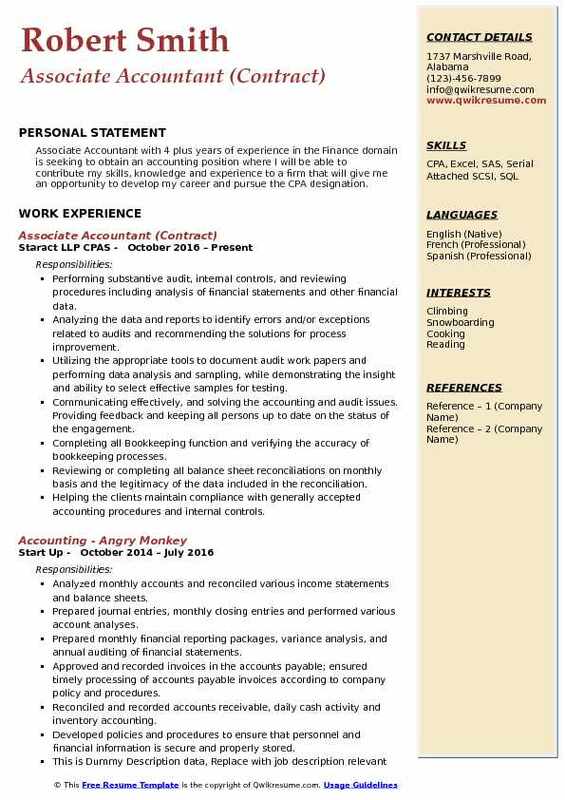 Experience in Accounts Payable, Accounts Receivable, General Ledger, Payroll, Analysis, Reconciliations, etc. Strong organizer, problem solver, good time-management and detailed oriented who readily adapts to change and exceeds expectations. Processing heavy volume journal entries as a team member in charge of month-end. Member of finance team cooperating with auditors during yearly audits performed. Preparing the daily sales report detailed by brand and distribution channel for the Managers. Reconciling the monthly general ledger accounts to ensure proper coding and posting. Collaborating with colleagues from 12 subsidiaries to complete intercompany. Preparing the monthly sales commission reports for independent sales representatives. Supporting the accounts receivable team in dealings related to tax compliance. Calculating the tax for all the U.S states filings performed by Director of Finance. Verifying and reporting the travel expenses via Online Expense Management System. In charge of collection and chargeback management for large retail and department. 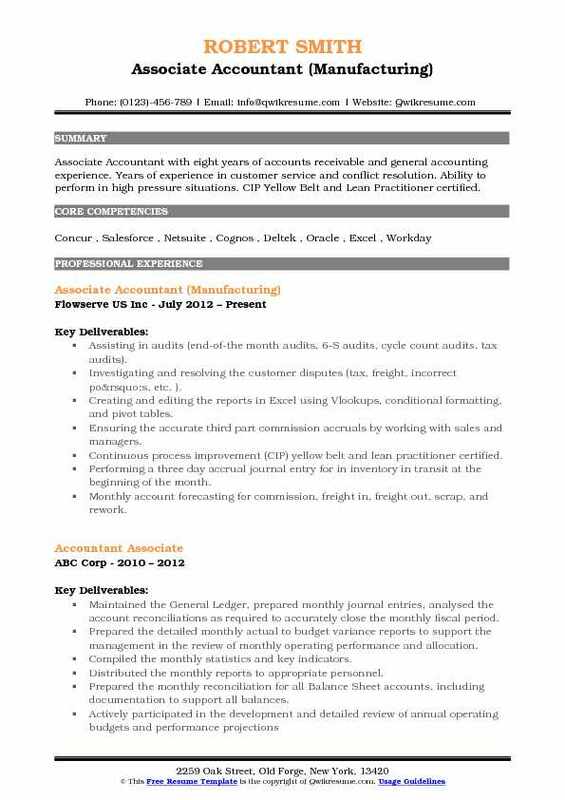 Summary : Associate Accountant with eight years of accounts receivable and general accounting experience. Years of experience in customer service and conflict resolution. Ability to perform in high pressure situations. CIP Yellow Belt and Lean Practitioner certified. Assisting in audits (end-of-the month audits, 6-S audits, cycle count audits, tax audits). Investigating and resolving the customer disputes (tax, freight, incorrect po’s, etc. ). Creating and editing the reports in Excel using Vlookups, conditional formatting, and pivot tables. Ensuring the accurate third part commission accruals by working with sales and managers. Continuous process improvement (CIP) yellow belt and lean practitioner certified. Performing a three day accrual journal entry for in inventory in transit at the beginning of the month. Monthly account forecasting for commission, freight in, freight out, scrap, and rework. Performing account reconciliations for freight in, freight out, commissions, rebate, scrap, and rework. Managing various accounts through the month by performing journal entries. Setting up suppliers in the system so purchase orders and payments can be made. Training the new associates on the FA process, including Oracle and ESSbase systems. 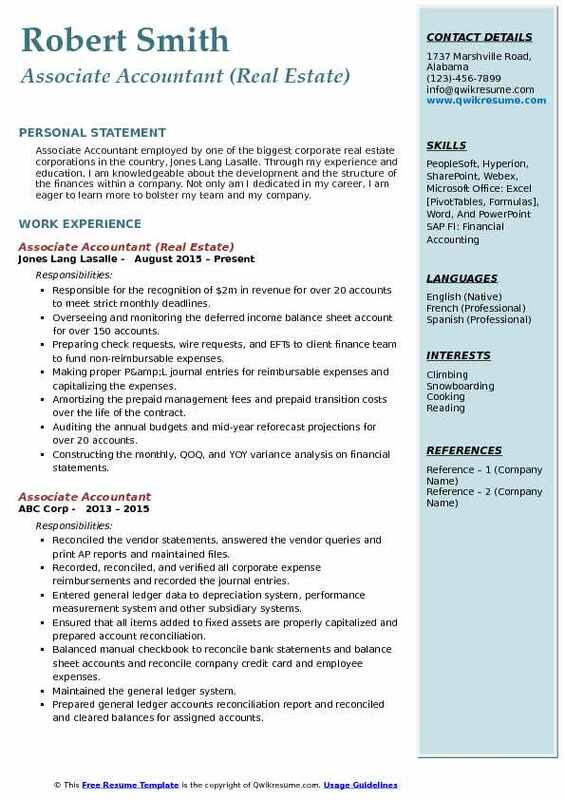 Objective : Associate Accountant with 4 plus years of experience in the Finance domain is seeking to obtain an accounting position where I will be able to contribute my skills, knowledge and experience to a firm that will give me an opportunity to develop my career and pursue the CPA designation. Performing substantive audit, internal controls, and reviewing procedures including analysis of financial statements and other financial data. Analyzing the data and reports to identify errors and/or exceptions related to audits and recommending the solutions for process improvement. Utilizing the appropriate tools to document audit work papers and performing data analysis and sampling, while demonstrating the insight and ability to select effective samples for testing. Communicating effectively, and solving the accounting and audit issues. Providing feedback and keeping all persons up to date on the status of the engagement. Completing all Bookkeeping function and verifying the accuracy of bookkeeping processes. Reviewing or completing all balance sheet reconciliations on monthly basis and the legitimacy of the data included in the reconciliation. Helping the clients maintain compliance with generally accepted accounting procedures and internal controls. Managing the activities including clients billings, credit card processing, payroll expenses and vendor payments. Processing the quarterly federal and state estimated tax and assure compliance with the law. Preparing and reviewing moderate to complex individual, corporation, partnership, and gift tax returns. 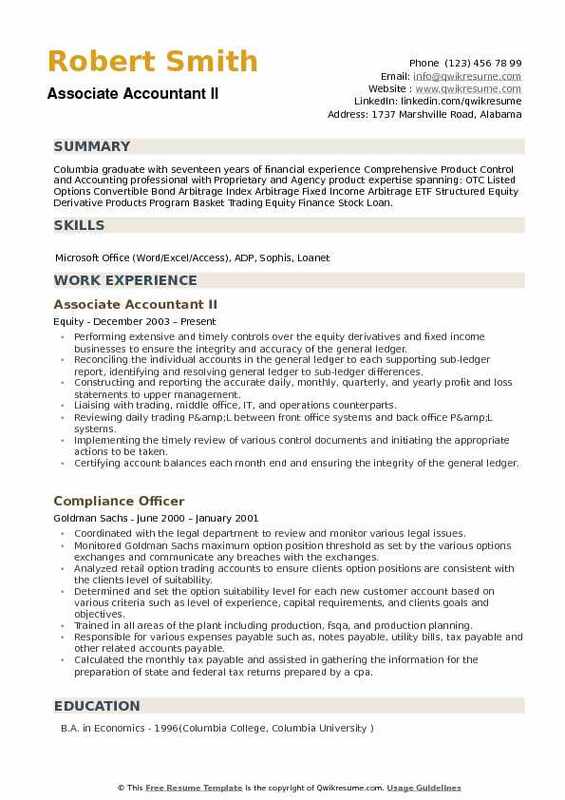 Summary : Columbia graduate with seventeen years of financial experience Comprehensive Product Control and Accounting professional with Proprietary and Agency product expertise spanning: OTC Listed Options Convertible Bond Arbitrage Index Arbitrage Fixed Income Arbitrage ETF Structured Equity Derivative Products Program Basket Trading Equity Finance Stock Loan. Performing extensive and timely controls over the equity derivatives and fixed income businesses to ensure the integrity and accuracy of the general ledger. Reconciling the individual accounts in the general ledger to each supporting sub-ledger report, identifying and resolving general ledger to sub-ledger differences. Constructing and reporting the accurate daily, monthly, quarterly, and yearly profit and loss statements to upper management. Liaising with trading, middle office, IT, and operations counterparts. Reviewing daily trading P&L between front office systems and back office P&L systems. Implementing the timely review of various control documents and initiating the appropriate actions to be taken. Certifying account balances each month end and ensuring the integrity of the general ledger. Working with IT developers to construct, streamline, and improve various accounting processes, identify any problems with the various accounting systems and initiating solutions to make them more efficient. Managing the related inquiries from internal and external auditors concerning the various equity derivative and fixed income trading P&Ls. Participated in a year-long general ledger migration project by performing numerous tests and verifying the validity of the new general ledger account balances.